We purchased this toy used, when my children were about 11 months old. We were at a thrift shop and my children fell in love with it instantly. The batteries were already in it so it was a buzz from the start. All it needed was to be cleaned for my sanity. The lion is easy to move. 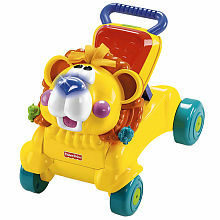 The wheels make it easy to transport the lion from room to room. In fact, my children do this all by themselves, no extra assistance needed. It grows with your child. The seat can come up to create a walker for your child, and then when the seat is down is a riding toy. The lion is extremely durable. I also like the that the batteries seem to last for a long time. Some toys eat batteries like a cow its grass, but not this toy. I haven’t had to replace the batteries since we bought it and it has been almost a year. The music and lion’s roar keeps my children laughing continuously. The toy is great for teaching sharing because it allows one child to sit and the other to push. The music can be annoying if they press it over and over, but I like hearing my children enjoy themselves so it doesn’t bother me much. It would be nice if there were paddles, for $30./$40 that would have made sense.